Finally: Dishing Up Washington, the book I worked on for most of 2011, is coming out. It’s a month away. So while I’ll be spending the next few weeks in and out of Seattle (New Yorkers, come see me this weekend! ), I thought I’d give you a little glimpse into the book, including the gorgeous photos by Lara Ferroni – and a few perfect recipes for your Thanksgiving table. In fact, the things I’ll be posting here are just what I’d cook, if I hadn’t already planned on being the lazy one this year. At Vashon Island’s Kurtwood Farms, owner Kurt Timmermeister makes a bloomy-rind cow’s milk cheese called Dinah’s Cheese. When it was first released in 2009, Seattle swooned; nowhere in the state is there a farmstead Camembert-style cheese so clearly fit for international fame. In my official opinion, it would be an atrocity to do anything to Dinah’s Cheese besides eat it at room temperature at its peak ripeness, when the middle succumbs to a thumb’s soft pressure and the inside has the consistency of thick homemade pudding. But should your path cross a certain gooey cheese good enough to make you voluntarily lie prostrate in a busy street, and you promise not to tell anyone that you’d consider putting half a wheel into a simple potato gratin with little bits of pancetta and a glug of cream, read on. This is just the right way to do the wrong thing. 1. Preheat the oven to 350°F. Coat an 8- by 8-inch (or similar) gratin dish with the oil and set aside. 2. Heat a medium skillet over medium heat. Add the pancetta, and cook, stirring occasionally, until crisp, 6 to 8 minutes. Set aside. 4. Spread one-third of the potatoes along the bottom of the dish, overlapping them as necessary. Scatter one-third of the cooked pancetta over the potatoes, followed by one-third of the cheese, broken up into little bits. Repeat with the remaining ingredients, making two more layers, ending with pancetta and cheese. Whisk the cream, milk, and egg together in a small bowl, then carefully pour the liquid mixture over the potatoes. 5. 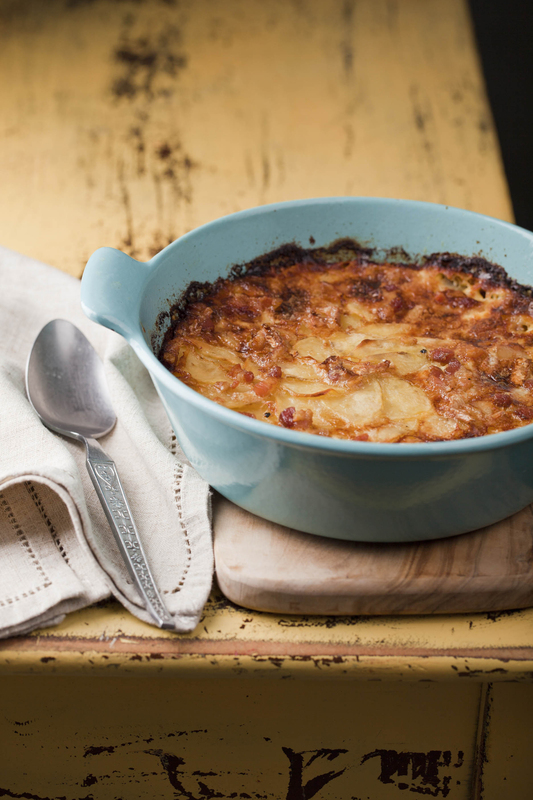 Cover the gratin tightly with aluminum foil and bake for 30 minutes. Remove the foil, increase the temperature to 400°F, and bake 40 to 45 minutes longer, or until the potatoes are lightly browned on top and a skewer can pierce through the layers easily. Let cool for 10 to 15 minutes before serving. What an absurdly delicious idea. I am on it. And I promise not to tell. This looks amazing! Would I be able to find Dinah’s in Portland, do you think? It should be available (says Kurt) at Steve’s Cheese Bar and at a few area New Seasons locations…. good luck! Congratulations!! When/where will we be able to buy the book?! Wonderful…I’ll keep an eye out! Congrats again.